What Makes a Radio Collectible? There’s a different answer for every radio and collector. Some of us look for the radios we had or wanted as kids. Others of us are drawn to a particular style, or era, country of origin or even manufacturer. Some of today’s most popular collectibles were made by Arvin, Admiral, Allied Knight, Boy's, Bulova, Channel Master, Emerson, Eico, GE, Global, Grundig, Hitachi, Heathkit, Hoffman, Kobe Kogyo, Lafayette, Olson, Motorola, Magnavox, Nordmende, Panasonic, Philco, RCA, Regency, Sony, Silvertone, Standard Micronic, Sylvania, Tokai, Toshiba, Realtone, Wilco, Westinghouse, and Zenith, just to name a few. 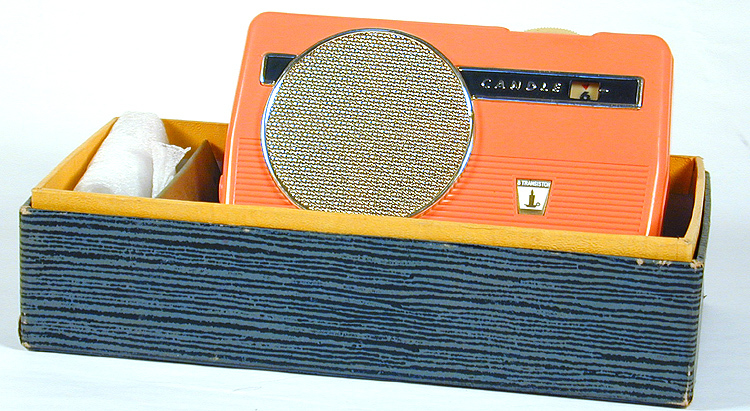 Here's a look at some of these popular collectible radios and the companies who made them. The Admiral Corporation was founded in 1934 by Ross David Siragusa as the Continental Radio and Television Corporation. Siragusa sold his car and most of his home furniture to raise the $3,400 in seed money for his radio manufacturing company. In December 1940 the company was incorporated in Delaware as the Admiral Corporation. 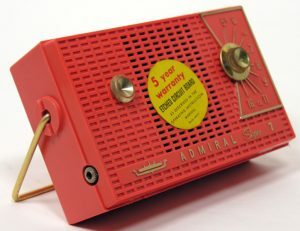 At perhaps its most profitable period in 1953, Admiral grossed $251 million, manufacturing military electronics, televisions, home appliances, and of course radios. By 1954 Admiral had ten manufacturing plants in the United States and others in Canada, Australia, Italy, and Mexico. In the mid-1950s labor and material costs began to rise steadily and the increased competition from Asian imports in the 1960s and 1970s created problems for Admiral. During the 1960s and 1970s Admiral continued in its efforts to reduce overhead costs and increase plant efficiencies but with little long-term success. Admiral's sales grew from $347 million in 1967 to more than $600 million in 1973. However, profits were falling sharply. In 1971 Admiral sold its color picture tube manufacturing operations to RCA, and in 1973 the company agreed to be acquired by Rockwell International for $78 million. Rockwell later sold Admiral's domestic appliance business to Magic Chef, Inc.
Allied Radio was started in 1921, (not in1928, as many think). It began as the mail-order and parts distribution arm of Columbia Radio Corporation. Allied Radio primarily served amateur electronic hobbyists. As the company grew, it slowly added retail stores selling both parts and consumer electronics to hobbyist, HAMs, radio and Hi-Fi enthusiasts. Allied began selling electronic DIY kits and other parts to consumers via catalogs around 1932. Through the war years the company serviced primarily government an industrial customers. In 1962, the first industrial catalog was released for its new commercial supplier division under the name of Allied Electronics rather than Allied Radio. Along with the rest of America’s electronics giants, by the 1970s, Allied struggled as the consumer electronics business became more challenging due to increased competition from such offshore companies as Sony, Panasonic, and JVC. Allied Radio and Allied Electronics were both purchased by Tandy Corporation around 1970 and headquarters were moved from Chicago to Fort Worth, Texas. The retail division was merged with Tandy's retail unit to become Allied Radio Shack. As a result of the merger, some shopping centers had two competing Allied Radio Shack stores. Allied Radio storefronts were eventually closed, with the remaining Radio Shack stores taking on both product lines. By 1973 due directly to Federal Court action, Tandy was ordered to divest itself of Allied Radio, and the Tandy stores would once again bear the Radio Shack name. Since Tandy did not have a commercial-industrial supply division, Allied Electronics would continue as a "Division of Tandy Corporation," serving the manufacturing sector until the mid-1980s when it once again changed owners. Allied's main competitors were Radio Shack, Lafayette Radio, Olson Electronics, and local independent dealers. Their primary house brands included "Allied" and "Knight-Kit". Today Allied primarily services the industrial components/equipment market, with no retail or mail-order consumer products. Allied Electronics is now part of the UK Electrocomponents Group Electrocomponents plc, which also operates across the rest of the world as RS or RS Components and under localized variations of the name such as Radiospares (France) and Radionics (Irelend). Arvin was founded in 1927 as a manufacturer of automobile parts. They made car radios in 1933, home radios in 1934, and television starting in 1948. 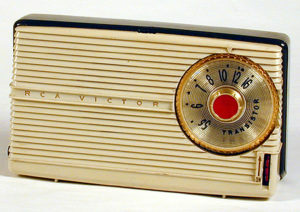 Arvin produced radio and television products under the "Arvin" name until 1955, then marketed some of their products under the Silvertone (Sears) brand name, until 1971. Boy’s radios were made by numerous offshore manufacturers and are really a category of radios rather than a brand in the traditional sense. For example, Sharp, Candle, Realtone and others made Boy’s radios. They all had one thing in common. Boy’s radios always had no more than two transistors. This made it possible to import them into the U.S. without paying tariffs designed to protect American radio manufacturers. 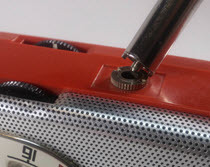 While, as a group, they have a reputation of being cheaply made and poor performers, quite a few Boy’s radios are remarkable sounding, have striking details and were built to respectable quality standards. This makes many of them quite popular with collectors. Founded as a jewelry shop in NYC 1875. Creates world-famous radio commercial in 1926 “at the tone it’s 9 PM, Bulova watch time.” They claim to have made the first clock radio in 1928. Early Bulova transistor sets include circa 1955 Regency TR-1 radios with the Bulova brand emblazoned on them. Later sets were manufactured by various other companies for Bulova, both in the United States and offshore. 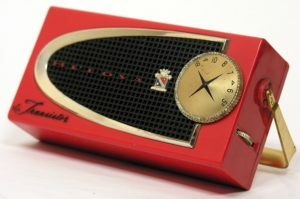 Bulova was able to sell their radios in jewelry stores and their early advertising and fancy products were obviously designed to appeal to “upscale” buyers. Candle was a Japanese manufacturer who made wonderful sets in delightful colors. They made a number of very collectible Boy’s radios as well. Headquartered in Ellenville, New York, Channel Master was founded in1949 and was an early leader in high quality outdoor television antenna design and manufacturing. Their transistor radios were always top performers and solidly built. 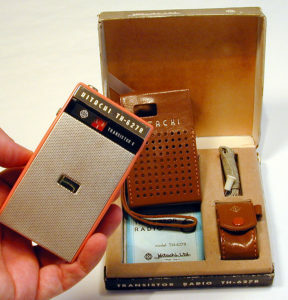 A relatively late entry into the transistor radio business their first sets were introduced in 1959, and all made offshore. 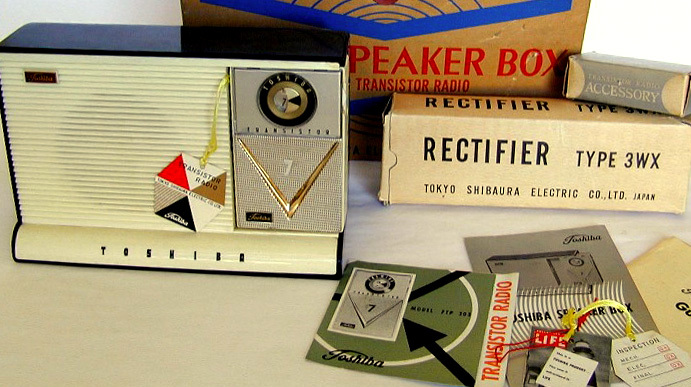 Continental Merchandise Company was a New York-based distributor of radios made by a variety of Japanese radio manufacturers. 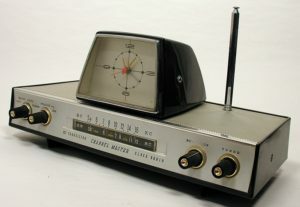 During the incestuous sixties radios made by Sharp, Crown, and perhaps others. 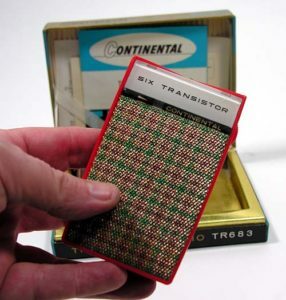 See Eric Wrobbel’s Collectible transistor Radios from Continental for more about this. Many of Continental’s sets were beautifully designed and well made. They are popular collectibles for those reasons. 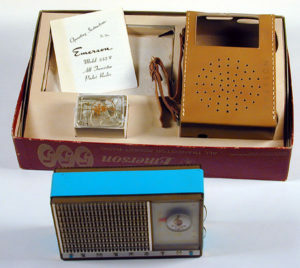 Emerson was an early transistor radio innovator and they have made some beautiful, very collectible sets worth owning. Apparently unsure of what to name his new company, founder Victor Hugo Emerson opened the doors in 1915 in New York City, calling his enterprise the Emerson Radio & Phonograph Corporation. It was later renamed the Emerson Corporation and the Emerson Television and Radio Corporation. Early brand names produced by the firm include Emerson, Emersonette, Jewel, Kadette, Mickey-Mouse. Victor Hugo Emerson was recording engineer and executive who worked, early-on, with Thomas A. Edison. Emerson offered one of the last of the external-horn phonographs for only $3. Its main product, however, was Universal Cut Records, capable of being played laterally or vertically. Emerson introduced the first radio-phonograph combination sold in the United States. 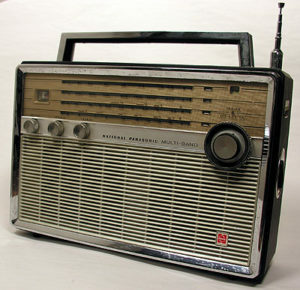 During the Great Depression it introduced a "peewee" radio about 8 inches long and 6 inches wide. Emerson Radio & Phonograph held one-sixth of the U.S. radio market in 1942, when the company converted to military production for World War II. It became a public corporation in 1943. The company was credited with—or credited itself with such firsts as the clock radio, (an advance Bulova also claims), self-powered radio, and transistorized pocket radio, obviously a bit of an exaggeration on at one, and perhaps all counts. Emerson also entered air conditioning by purchasing the Quiet Heet Corp. in 1953 and began making tape recorders in 1955. 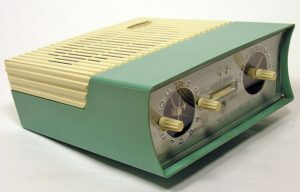 In 1958 Emerson Radio & Phonograph paid $6 million to purchase the consumer products division of Allen B. DuMont Laboratories, Inc. By this time, however, almost every existing U.S. household that wanted a TV set had bought one, and many customers were waiting for color television instead of buying a replacement set. Whoops. Emerson responded with a cost-cutting campaign that consolidated almost all manufacturing operations in a larger Jersey City plant and employed printed circuits for both radio and television output. In fiscal 1964—Emerson's last full year of independent operation it earned $2.1 million on sales of $68.2 million. 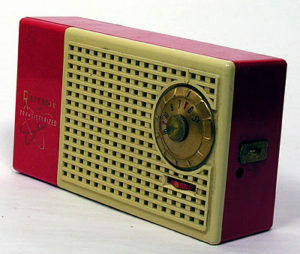 Emerson Radio & Phonograph was purchased in 1965 by National Union Electric Corp., a diversified manufacturer, for about $62 million in cash and stock. This company continued to produce television and radio sets and phonographs distributed under the Emerson and DuMont names and hi-fi equipment under the Pilot name. (Emerson had acquired the Pilot Radio Corp. from Jerrold Corp. in 1965.) Between 1967 and 1971 the division lost about $27 million. To alleviate the problem, National Union in 1970 contracted out the manufacturing of the Emerson unit's television sets and some of its other home entertainment products to Admiral Corp; laying off 1,800 employees. 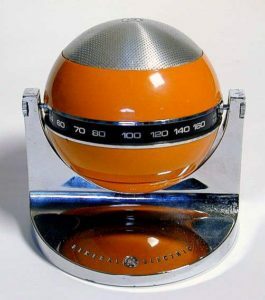 Emerson continued to be responsible for design, engineering, and marketing and also imported some of its home entertainment products from the Far East. In late 1972 National Union Electric announced that Emerson was discontinuing distribution of television sets and other home entertainment products. A license for marketing products under the Emerson name was sold to Brooklyn-based Major Electronics Corporation in 1973. Subsequently the company diversified into the production and sale of a broader line of low-priced home entertainment products, including stereos, radios, and clock radios. Major Electronics Corporation also began importing low-cost radios in 1971 and was only manufacturing portable phonographs in 1975. The company moved its headquarters to Secaucus, New Jersey, in 1976 and changed its name to Emerson Radio Corp. in 1977. The company survives and is heavily dependent on two customers: Walmart Stores, which took about 52 percent of its goods in fiscal 1999, and Target Stores, Inc; which took about 24 percent. Principal Subsidiaries include Emerson Radio (Hong Kong) Ltd.; Emerson Radio International Ltd. 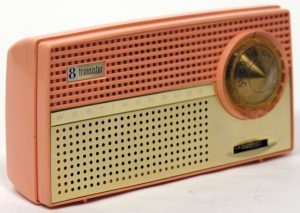 While arguably not a sought-after as, say, Toshiba or Hitachi sets, there are many important, collectible General Electric transistor radios, and the brand has a loyal following, for certain. General Electric certainly had a hand in the early days of radio, and their contributions to the transistor revolution were considerable. Another huge American manufacturer it was also a component manufacturer and operated radio and television networks. Perhaps no other vintage electronics manufacturer has such an avid following as Heath. Unassembled Heathkits are now extremely rare and fetch obscene prices and generate lots of traffic when they surface on eBay. Edward Bayard Heath founded his Heath Aeroplane Company during the early 1900's and in 1926, he produced an airplane in kit form. It was called the Heath Parasol. (Mr. Heath was killed during a test flight in 1931.) The Heath Company remained in the aircraft and replacement part business throughout World War II. Howard Anthony, an engineer, purchased the Heath Company in 1935. He also purchased a large stock of surplus wartime electronic parts, designed and "mail order marketed" an oscilloscope kit for $39.50. It was a hit. Mr. Anthony expanded his test instrument line and soon added amateur radio and hi-fi component kits. Today, the Heathkit Company, Inc. is still located in Benton Harbor, Michigan. It is completely out of the electronic kit business and now concentrates on Heathkit Educational Systems—electronic learning materials for classrooms, schools and training centers. Daystrom, Inc. acquired the Heath Company. 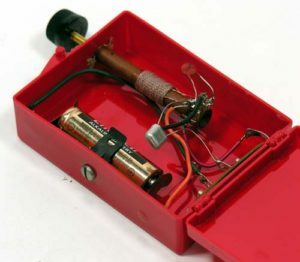 In 1962 and then Daystrom, Inc. was subsequently purchased by Schlumberger Limited, a leader in the development of electronic techniques for oil exploration. Collectors love Hitachi radios, and they have a fiercely loyal following. Beautiful looking, expertly built, often with aerospace fit and finish, Hitachi radios are very desirable. Founded by Namihei Odaira in 1910 as Hitachi Works, it was initially an electrical repair shop. Over the decades it has spawned multiple divisions making such diverse products as telecommunications gear, electronic components, elevators, earthmoving equipment, railroad locomotives and much, much more. Leaders and innovators in solar electricity, in 1955 Hoffman Electronics started selling photovoltaic cells priced at $25.00 per-cell and they were 2% efficient. By 1960 they were making cells that were 14% efficient. The first solar powered, 2-way radio, coast-to-coast conversation was accomplished from the roof of the Hoffman Electronics plant at El Monte, California in 1960. Oh yeah. 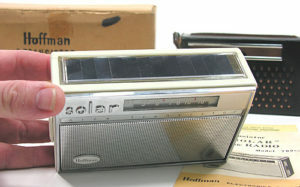 The sold solar powered radios as well. Many of them still play in the sunlight today. Less well known are Hoffman’s non-solar pocket sets which sound as beautiful as they look, if you can find one. If you are a boomer you remember this company that offered not only beautiful radios, but also radio kits, individual components and profusely illustrated instructions for a wide Varity of DIY electronics projects. Founded in 1920 and based in Syosset New York it had both a small retail and huge mail order presence. What hobbyist didn’t run to the mailbox hoping to find a new Lafayette catalog or flyer inside? At its peak Lafayette had perhaps 100 stores. The last one closed in the early eighties under relentless competitive pressure from Radio Shack and others. 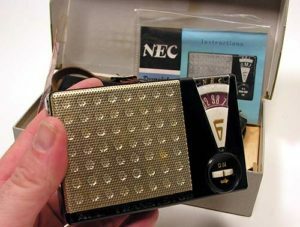 Collectors not only seek Lafayette’s transistor radios, they also scrounge eBay and hamfests looking for the firm’s test gear, components, instruction booklets, catalogs and so on. 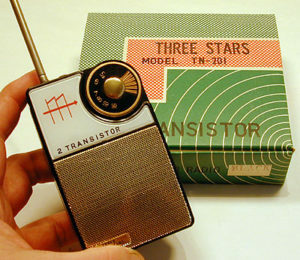 They were a very early player in the transistor radio marketplace with first sets arriving in the 1955-1956 time frame. Not considered by most to be the most beautiful or cleverly made sets, many Magnavox models are still quite collectible. Magnavox also purchased patents for, and began selling what they claim was the world’s first home video game called Odyssey in 1974, (There is some dispute about this), and the Laserdisc format in 1978, precursor to DVD technology. A huge Japanese manufacturing conglomerate virtually “atomic-bombed” out of existence in 1945, Mitsubishi bounced back to become another of those magnificent companies that, to this day, produces everything from tiny components to huge pieces of earthmoving equipment and everything in between. 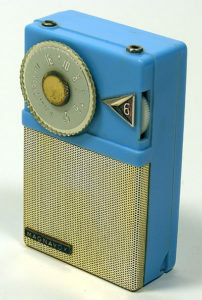 They made some breathtakingly beautiful transistor radios under their own name and for others. Check out these examples. Founded in 1928 by brothers Joseph and Paul V. Galvin, Motorola was initially named Galvin Manufacturing Corporation, and was based in Chicago, Illinois. The company got in on the ground floor of numerous radio markets, building external battery eliminators (A/C power supplies) for radios in 1928, and early car radios as far back as 1930. They were building public service two-way sets for police, fire and other early responders as far back 1936; produced the first military FM two-way radios in 1943, and car radiotelephones in 1946. Garvin changed its name to Motorola, Inc. in 1947. A component manufacturer, Motorola produced the world’s first “power transistors” in 1955, its first mass-produced semiconductor. 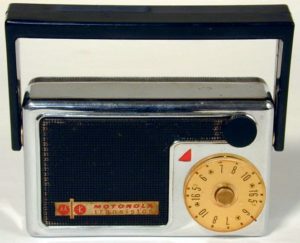 Early Motorola transistor radios were built like tanks, with heavy metal cases and innovative plastic handles containing antennae since the radio waves could not efficiently make it through those metal cases. Here’s another one of those Japanese powerhouses that evolved over the decades, taking on different names and roles over time. Besides radios it makes computers, telephones, digital cameras and much more, currently employing more than 300,000 workers. Founded in 1918, Matsushita Electric Industrial Co., Ltd. made some wonderful radios. Collectibles from this company wear the brand names National, Panasonic, Matsushita, and sometimes all three. Known for quality workmanship, innovative, sometimes whimsical designs and often stellar performance, these radios, whatever you call them are great additions to any collector’s shelf. The firm also created, and still creates private label products and components for other radio companies. Yet another early Tokyo-based innovator NEC (Nippon Electric Company, Limited) was founded in 1899. First products were telephone-related, with Western Electric as partners and investors. They entered the radio industry in about 1924 as broadcasters. Much of their production capability was destroyed during World War II, but they rebuilt, and by 1946 reopened its major plants. 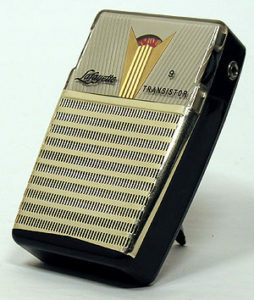 By 1950 they were transistor-savvy and selling pocket radios to Americans by 1957. Distinctive looking sets, they are definitely collectible. “I probably had just as much fun developing new products and searching all over the world for surplus items. I knew what the hobbyist and repairman need because I had started by repairing Crosleys and Atwater-Kents in 1928." At its peak there were hundreds of Olson retail stores, and the company’s catalog mailing list exceeded million names, a phenomenal number at the time. The firm also ran fascinating and fun marketing campaigns using such tactics as planting customers’ names in amongst the ad copy in catalogs. Spot your name, win a prize. They also offered cultured pearls to shoppers as purchasing incentives. Olson sold everything from components to audio gear to tools, aftermarket car radios, reverb kits that made your car interior sound like a cave, and of course, transistor radios and televisions. 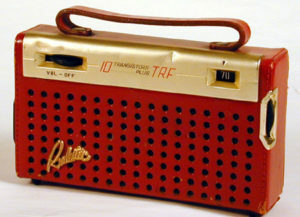 The product line was a mix of name brands and private-labeled products, often best known for their feature-rich “bang-for-the buck.” Only a few transistor radios were produced with the Olson brand on their face, but a host of other items are regularly seen in peoples’ collections including audio gear, experimenters’ parts, catalogs, and of course, those pearls, sometimes still in their wrappers. 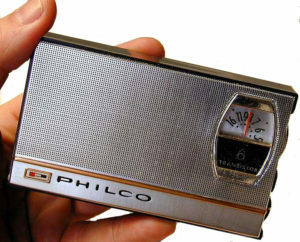 Like so many companies that made the radios we used as kids, Philco had many different names over its long history, and started out making something else—in this case, arc lights and storage batteries. Beginning as the Spencer Company in 1982, it changed its name to the Helios Electric Company, and then the Helios Manufacturing Company, and, in 1906 it became the Philadelphia Storage Battery Company. This scrappy firm was persistent and tenacious in the face of rapid technological change. In 1919 the name was changed to Philco. Through the twenties and thirties they sold battery charges and battery eliminators for radios, since few sets were AC powered at the time. In 1927 the company realized that recent technological advances were again about to cause them pain, since new vacuum tube designs made AC powered radios affordable and compact. The company decided they had better get into the radio manufacturing business ASAP since the need for batteries and eliminators would be decreasing in the near future. This necessitated acquiring expensive patents from RCA and others, which they did. Their vast and varied radio product line served them well, and made Philco a household name for decades. After the Second World War Philco invested lots of time, money and effort into expanding its product line, adding such things as ranges and freezers. They also pursued military electronics, and did early research work on transistors and computer technologies. These R&D costs damaged the bottom line to the point where they were purchased by Ford Motor Company in 1961. The Philco name survived briefly as Philco-Ford. Alas, Ford sold Philco to GTE-Sylvania in 1974. Both Sylvania and Philco eventually became part of Philips Consumer Electronics Corporation, known today for their Philips Magnavox line of consumer electronics products. 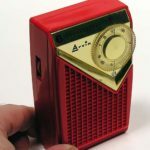 The first Philco transistor sets were produced in about 1955, and many are considered collectible, albeit not terribly stylish or innovative, and are perhaps somewhat under-appreciated buy collectors. Say “Raytheon” to any avid transistor radio collector and ears perk up. An early leader in defense technology, after World War II Raytheon aimed its considerable engineering and manufacturing talent in the direction of consumers. 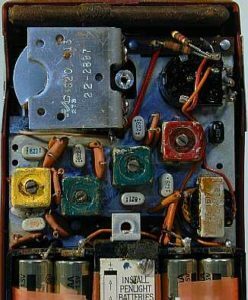 Besides producing the first affordable transistors for experimenters Raytheon was a very early radio maker, with its first product, the huge, hand-wired 8TP-1, hitting the street in February, 1955, only a few months after Regency’s TR-1. In 1955-56 Raytheon started shipping its first coat pocket sets, the T-100 series. The company private labeled these early sets and sold them to a host of companies, adding minor cosmetic design changes along the way. You will see them branded as Hallicrafters, Airline and Truetone. These early sets were also hand wired, and all of them are highly prized collectibles. Synonymous with the term radio RCA was in the electronic entertainment business from nearly the beginning as a manufacturer of transmitting equipment, receivers, radio networks and programming materials, (records, tapes and so on.) They made some interesting sets as early as 1955, and many of their fifties era sets are quite collectible. In the sixties RCA fell into a bit of a monotonous funk producing mostly boxy little pocket sets that all looked very much alike. A late bloomer, Realtone was most prolific in the late fifties through the mid-sixties. This Japanese company had a wonderful sense of style, and produced a variety of unusual looking and enjoyable radios to behold. Things change even on the same model over various production runs. It is almost as if the motto was “no two radios alike.” Very collectible, big and small, the made them all. Realtone also sold their wares to other companies who branded them Bradford, Olympic, Coronado, and so on. You need some Realtones on your shelf! 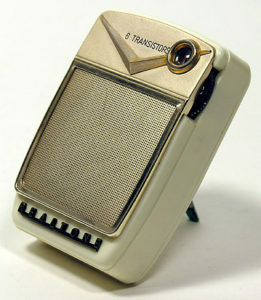 Creator of the first commercial transistor radio, the TR-1 launched in October 1954, the Indianapolis, Indiana maker of Regency radios, (I.D.E.A.) did not stop there. It produced numerous other models large and small, all with a following among collectors. Much has been written about Regency, especially their TR-1 and I’ll not repeat it all here. There are two exhaustive websites devoted to the TR-1 listed in Appendix Two, and definitely worth a visit. There you will learn about all the color variations, how to spot the earliest TR-1 sets and much more. 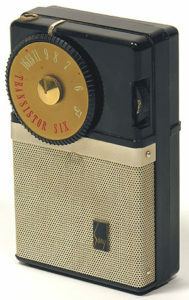 Besides Regency and TI/I.D.E.A/Regency, Sony was the other horse in the commercial transistor radio race. Some would say that after a slow start it was the hands-down winner of that race. Again, there is so much history written about Sony that I’ve included some suggested reading and links elsewhere on this site, leaving room here for lots of Sony eye candy. By the way, Sony was originally called Tokyo Tsushin Kogyo Kabushik, or Kaisha or Totsuko. The brand name Sony first appeared on the company’s first transistor radios in 1955 and the corporation adopted the name for its entire entity in 1958. 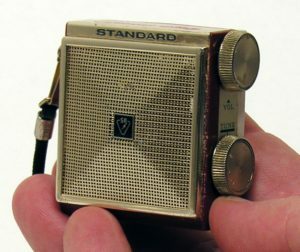 Best known for their “nearly too small to use” Micronic Ruby series, Standard Radio Corporation was a Japanese company that knew how to innovate. Besides making things small, they made them beautiful and sturdy. Add Standard to your wish list. Even by today's standards, these were pretty incredible examples of miniaturization and futuristic design. Sylvania started out by—what, anyone? Right! Renewing burnt-out light bulbs. (What? You’ve been tossing yours in the trash all these years?) The year was 1901, the place Middleton, Massachusetts, and the entrepreneur a guy named Frank Poor. Fast forward to about 1942 when the firm moved into consumer electronics and was recognized by its “flashing S” logo. Sylvania merged with General telephone in 1959, and is now owned by OSRAM GmbH inn Germany. 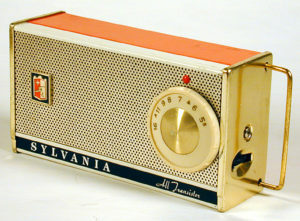 Sylvania made some interesting transistor radios back in the day, but were never really style or trendsetters. Many of their sets were marketed under the Golden Shield brand name. 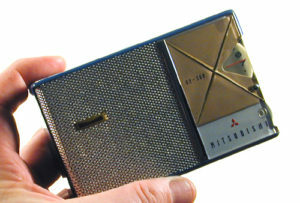 For some, Toshiba is the holy grail of collectible transistor radio manufacturers. Toshiba radios have it all—style, quality, innovative engineering and performance. You can almost tell you have picked up a Toshiba even if you are blindfolded. The heft, the balance, the way it seems to help you hold it all make these delightful artifacts. Any serious collector has a bunch of Toshiba sets on the shelf and is always looking for the next good score. Toshiba had some time to practice getting good at designing and manufacturing things. 1875 saw the establishment of Tanaka Seizo-sho (Tanaka Engineering Works), Japan's first manufacturer of telegraphic equipment. Its founder, Hisashige Tanaka (1799 - 1881), was well known from his youth for inventions that included mechanical dolls and a perpetual clock. Under the name Shibaura Seisaku-sho (Shibaura Engineering Works), his company became one of Japan's largest manufacturers of heavy electrical apparatus. In 1890, Hakunetsu-sha & Co., Ltd. was established as Japan's first plant for electric incandescent lamps. Subsequent diversification saw the company evolve as a manufacturer of consumer products. In 1899, the company was renamed Tokyo Denki (Tokyo Electric Co.). In 1939, these two companies, leaders in their respective fields, merged to form an integrated electric equipment manufacturer, Tokyo Shibaura Denki (Tokyo Shibaura Electric Co., Ltd.). The company was regularly referred to simply as Toshiba, which became its official name in 1978. But that’s enough about the founders and their mechanical dolls. 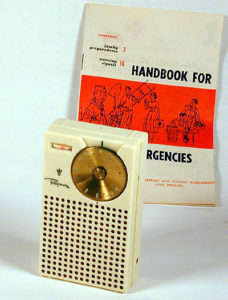 Toshiba also made radios branded Trancel, Realistic Penncrest, Norwood, Philco, Kalmar, to name just a few. The company sold excellent transistors and other miniature components to numerous other radio makers as well. Check out these wonderful radios that began appearing around 1958. Westinghouse Electric Corporation, the American Industrial Revolution giant was founded in 1884, and incorporated in 1886 by George Westinghouse. He’s the fellow who harnessed Niagara Falls as a source of electricity in 1896 and won a bitter battle with Thomas Edison over whather we should use Alternating Current (AC) or Direct Current (DC) in our homes and businesses. George won and that’s AC coming out ofg your wall socket. But did you know that Westinghouse is now owned by Japan giant Toshiba! The sale occurred in 2006 when Toshiba acquired more than half of Westinghouse’s stock for $5.4 billion. Westinghouse produced home radios starting in about 1921, and transistor sets around 1957. Well made and very retro in appearance, Westinghouse transistor radios have a following among collectors, but nowhere near the cache of Toshiba’s articfacts. Zenith is another well-documented legend in radio history, and entire books have been written about tiny segments of the company and it’s accomplishments. So here’s the Readers Digest version. Check out the reference suggestions at the end of this book for more reading options. Zenith started as a producer of amateur radio equipment about 1918 in Chicago Illinois. The name Zenith is said to be derived from the founder’s (Eugene F. McDonald’s) HAM call sign 9ZN. 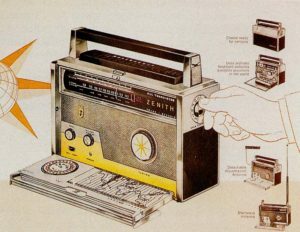 Zenith really was at the forefront of portable radio engineering long before the transistor era. McDonald was a gadget freak who constantly tested his company products and pushed his engineers to exceed and excel, which they did, indeed. All manor of Zenith portables are collectible including the venerable Trans-Oceanic series, and the one artifact every transistor radio collector needs to own, the fabulous Royal 500H. Earlier Royal 500 radios are equally desirable, particularly the early hand-wired sets that predate Zenith’s printed circuit sets. 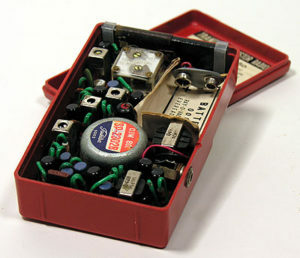 In fact, Zenith was slow to adopt printed circuit wiring, advertising the advantages of hand-wiring to the bitter end. Check out these interesting and innovative radios from a truly innovated company which, by the way, also invented the wireless television remote control, FM multiplex (stereo), hearing aid innovations and much more. By the way, Norman Smith’s book Zenith Transistor Radios, Evolution of a Classic is a must-read for any mid-century electronics enthusiast. Global and Zephyr are two names that always make vintage radio shoppers pause and scroll back when they see them on eBay. It’s easy to understand why. These beautiful sets were first seen around 1959, and appear to have been made by several companies both in Japan and Hong Kong. Likely manufacturers include Constant, Awai, and others. There are numerous variations to be found on these sets even those bearing the same model numbers. Half the fun of collecting transistor radios is finding some oddball set you have never seen before from a company you have never heard of before. And no matter how long you collect you will have that delightful experience on a regular basis. Most of the US collectors I know concentrate on mid-century radios made in America, Japan, and perhaps Korea. But there is a whole other world of international collectors out there concentrating on Norelco, Phillips, and other sets. Are you one of those collectors? Can you enlighten us here? I was looking for the pocket radio I had as a child, got it circa 1962. It had a one transistor reflex design (transistor used as RF and audio amplifier, diode detector). 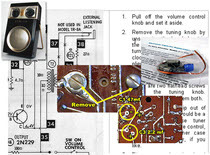 When I look at classic radio pages all I seem to find are multiple transistor and heterodyne (IF cans) designs.